Our Stilton is handcrafted by Colston Bassett, one of England's smallest and oldest Stilton producers, and selected specially for Tomales Bay Foods by Jason Hinds and Randolph Hodgson at Neal's Yard Dairy. 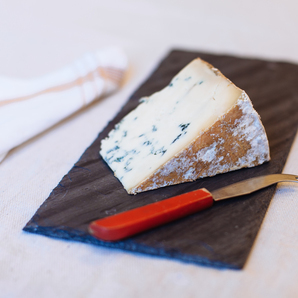 This classic blue is made with the milk of four dairies that still use some of the original pastures first associated with the dairy in the 1920s. In the making of Stilton, curds are hand-ladled to create an incredibly luscious texture, similar to that of chilled butter. Molded into sturdy cylinders, the wheels are pierced and salted, then turned regularly for up to six months of aging. At the request of Neal's Yard Dairy, our selected wheels of Stilton are pierced later in their life, giving them more time to establish base flavors before the blue veining takes hold. Towards the center of the wheel, the profile is brighter with a vibrant fruity tang. Closer to the rind, the flavors become earthier and more savory, with hints of roasted meat. 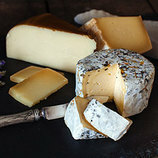 Full of flavor, thanks to the use of traditional rennet and splendid, high-quality milk, Colston Bassett Stilton is often considered the king of blues.